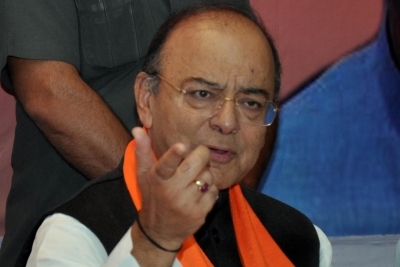 New Delhi, Feb 12 (IANS) Union Minister Arun Jaitley on Tuesday hit out at Congress President Rahul Gandhi for continuously targeting Prime Minister Narendra Modi over the Rafale fighter jet deal, saying in mature democracies those who deliberately rely on "falsehood" are banished from public life. In a blogpost, the senior BJP leader also slammed him for attacking the Comptroller and Auditor General of India (CAG), whose report on the controversial deal is likely to tabled in Parliament on Wednesday, and asked the Opposition leader "how many lies he needs to peddle to sustain a sinking synasty." "Truth is both precious and sacrosanct. In mature democracies those who deliberately rely on falsehood are banished from public life. There is no doubt that with the changing socio-economic profile, this will inevitably happen in India," he said. Attacking the Congress over dynasty politics, he said in modern world dynasties inherently have their limitations and aspirational societies abhor kingdoms which insist on accountability and performance. "But the grand old party of Indian politics has sadly become a captive of a dynasty. Many of its senior leaders lack the courage and moral authority to advise the dynasts to change course. This trend started in the early 1970s; climaxed during the Emergency and has continued ever since. "The slave mentality of senior leaders convinces them that they must only sing the song scripted by the dynast. A contrarian opinion will cost them their political career. When the dynast speaks lies, they all join the chorus," he said. Calling the opposition parties coming together as "mahajhootbandhan" Jaitley reiterated that thousands of crores of public money has been saved in this deal and accused the Opposition of manufacturing "new falsehood" on a daily basis. "How many lies are necessary to be peddled to save a sinking dynasty? The contagion effect of falsehood is fairly large. It appears to have spread to other colleagues in the Mahajhootbandhan," he said. Referring to Rahul Gandhi's charges on Rafale pricing, he said the "dynast" knows that his Rs 500 crore vs Rs 1,600 crore "kindergarten" argument was a fictional story and no one would ever buy it because facts don't support it. "Even before the contents of the CAG report are known, an attack on the institution of the CAG is launched. The dynast and his friends have in the past even attacked the Supreme Court when it rejected the writ petition on Rafale. The procedure argument that there was no Defence Acquisition Council, no CCS, no Contract Negotiation Committee was a blatant lie. The Rs 30,000 crore favour to a private company is non-existent. "The use of sliced document by a newspaper is unprecedented in the history. The use of an incomplete document is certainly not in consonance with the spirit of free speech. The 'integrity pact' argument is belied by the fact that even in earlier purchases through inter-governmental agreement with Russia and the United States, such pacts were not there. Now without a shred of evidence, a fictional conflict of interest of the CAG is invented," he said. Rahul Gandhi had dubbed the CAG report on Defence deal including the Rafale deal, which is yet to be tabled in Parliament, as "worthless" and said it was "an attempt to cover up". "The CAG report is not Comptroller and Auditor General Report but Chowkidar' Auditor General Report. It is Narendra Modi's report written for the chowkidar, on behalf of the chowkidar, for the chowkidar and by the chowkidar," he said.